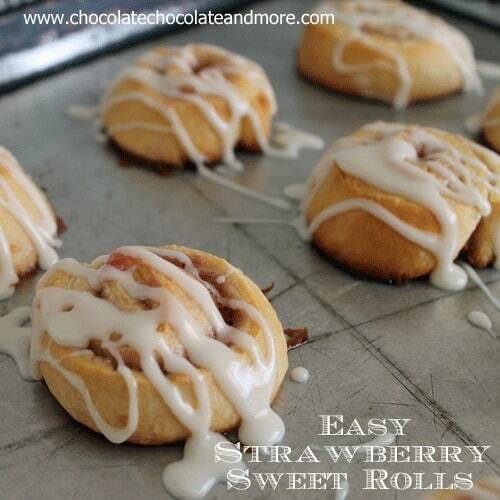 Easy Strawberry Sweet Rolls - Chocolate Chocolate and More! 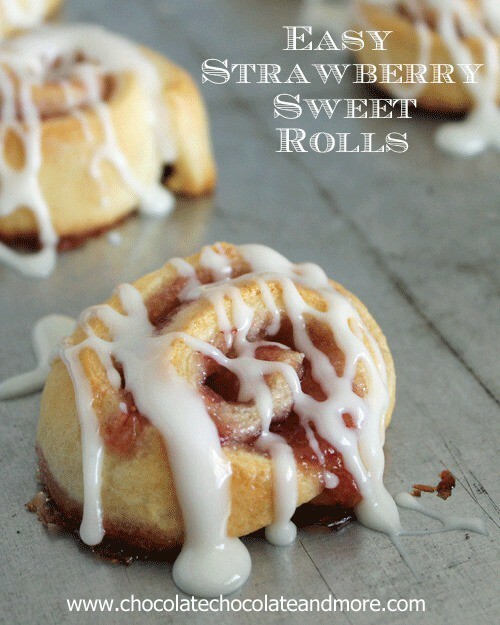 Easy Strawberry Sweet Rolls-you won’t believe how easy these are to make! 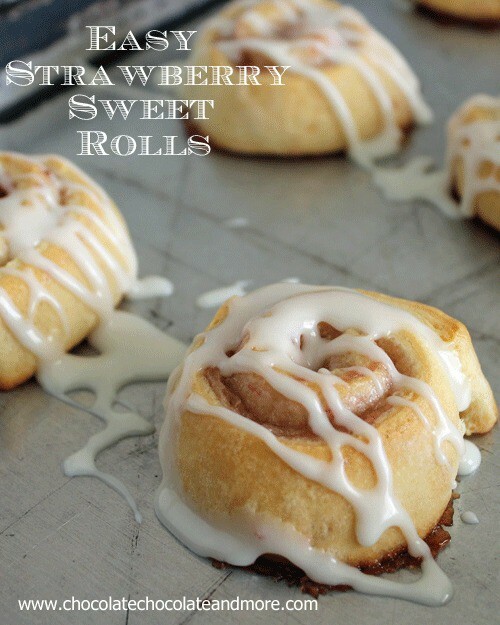 These Strawberry Sweet Rolls are the result of cleaning out my refrigerator. I thought about taking a picture of how jammed packed my fridge is but thought I might scare you all off. With 3 kids in the house, I buy milk 2 gallons at a time, 2 dozen eggs, various fruits and veggies, lunch meats and cheeses. These are the “perishables.” The things that get turned over and used constantly. I can live with this. It’s the long lasting items that take up all the space. 3 different kinds of pickles, 2 types of relish, 3 different mustards, salad dressings, Mayonnaise, 2 jars of Jelly, a jar of yeast. A jar of bacon grease. Yes, in the south you keep some bacon grease on hand. Just a dab in some recipes can make a huge flavor difference. Leftovers. The hubby will cook up sausage and biscuits and then reheat them for breakfast during the week. Roasted Chicken, I’ll probably make that into chicken salad for lunch. The stew beef we had for dinner tonight, you just run out of room. And we have one of the biggest refrigerators they make. And a full size freezer in the laundry room. I wanted to make some overnight rolls. That meant I had to make room for a large bowl. If I hadn’t just restocked our milk supply this morning I would have been ok. 3 full gallons of milk. Going to have to make adjustments on the other shelves. Time to see what’s almost empty. What can we use up. As I’m moving the strawberry jelly to the door I notice it’s almost empty. I put it on the counter as something that might have to go. Then I find the crescent dough, hidden behind 5 other things. Why it was on the shelf I can only guess. This is one of the hazards of having the kids help you put the groceries away. I’m just glad I found it. Then it hits me. make some rolls, use up the jelly. When refrigerating the dough roll, if you have an empty paper towel roll, they come in handy for keeping the dough in shape. Place a sheet of plastic wrap over your work surface. Lightly dust it with flour. Unroll crescent dough onto plastic wrap. 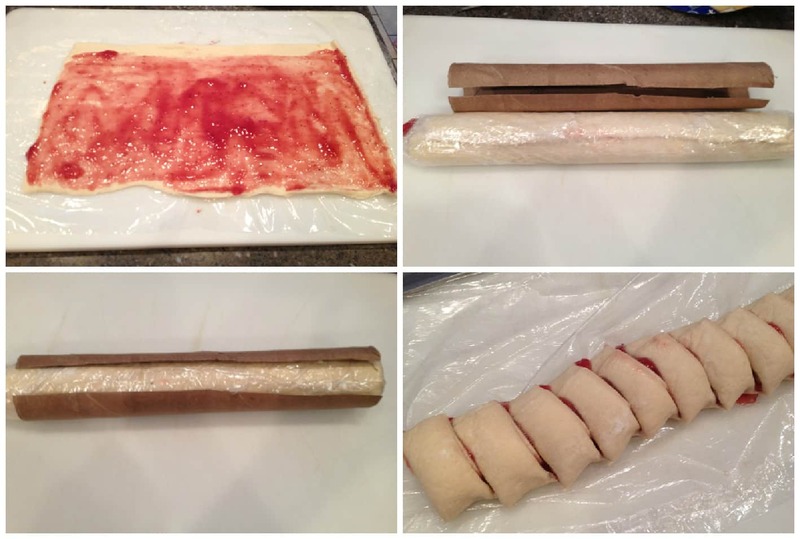 Spread jelly over entire dough leaving 1/2 inch along one long side. Roll dough starting on the long edge with the jelly. Use the plastic wrap to help roll. Seal roll in your plastic wrap and refrigerate for a least an hour. Remove from refrigerator, unwrap dough log and slice into sections about 3/4 inch. Place on parchment lined baking sheet. Bake in preheated 375 degree over for about 12 minutes, just until golden brown. Remove from oven and drizzle with glaze. Serve warm. To make glaze, combine sugar, milk and vanilla till smooth. If too thick add a few more drops of milk. 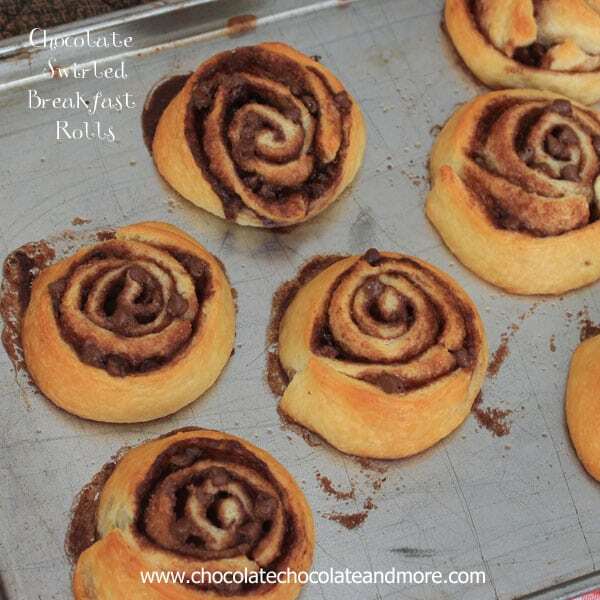 These rolls didn’t last 10 minutes after the kids got home from school. 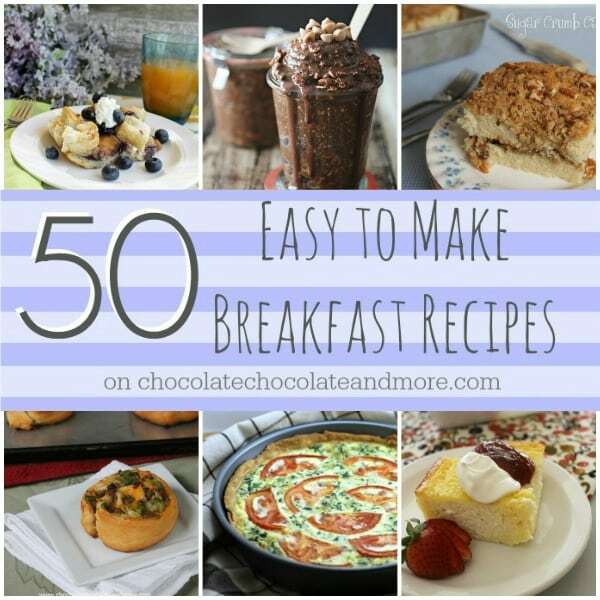 Want more easy morning treats? Joan, you are a genius! These look amazing and I can’t wait to try them! 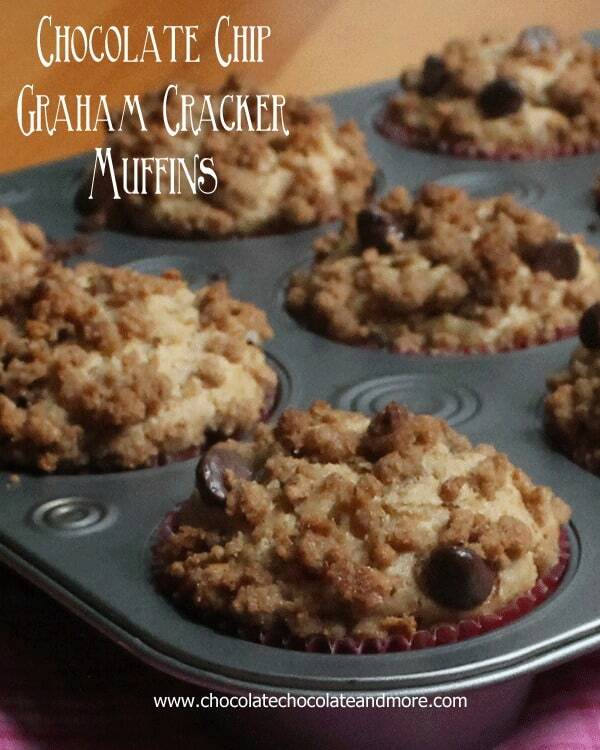 I made these for our Women’s Bible Study last week and they were a big hit. I used seedless raspberry jam bc that’s what I had. Thanks for a great recipe, Joan! 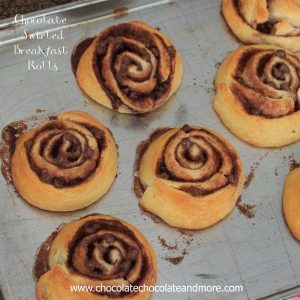 Haha…this sounds like our fridge when I was living at home 🙂 I think these sweet rolls are a fantastic way of cleaning out. There are so many different fruit rolls I want to try. This one looks so good! You are brilliant! I love ANYTHING in crescent rolls. What a great idea to use up ‘leftovers’. YUMMMY! Thanks for sharing at our Weekend Potluck table. I am dying for a yeasty roll! 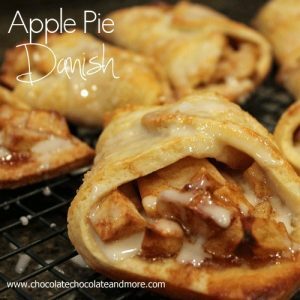 I may need to make some this weekend! My 24 year old “kid” temporarily lives at home and my 20 year old “kid” is away at school. So what’s my excuse for an over full fridge that no one can find anything in? Maybe I can be as lucky as you and make something delicious out of what I find there! I am going to go see if there is some crescent dough and jam 🙂 Thanks for the inspiration. Our fridge gets pretty full too. I’m constantly baking, so I’m always stocking up on essentials like butter and eggs, plus we always have a ton of fresh produce. It makes my mom crazy though! These rolls look awesome, so simple, but so good! I so want to make these. Would do it immediately except I have no crescent dough in the frig – boo hoo! Heading to the grocery store. I’ve got lots of strawberry jam in my freezer begging to be used – they looked delicious! 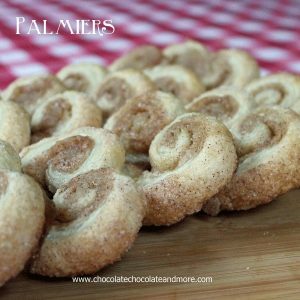 I never thought of using leftover jelly/jam to make sweet rolls before. Now I know what to do with that jar of raspberry jam sitting in my fridge. 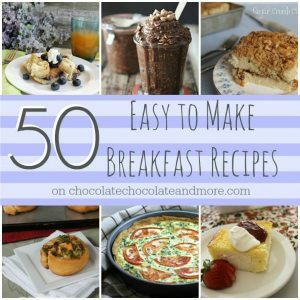 I’ll even add some chocolate chips. Thanks for the genius idea! I love this! So easy to make and different from the usual. This would be a fun Valentine breakfast! Yum! These look amazing! and easy – I’ll have to try these with fresh jam this season. That sounds like my fridge! These look great!Thanks for sharing at Show Me Your Plaid Monday’s! Oh my word, these are dangerously easy! Love it! I totally want 3 of these right now!! I hope you are having a wonderful weekend, and join me tomorrow night for Make the Scene Monday #60! 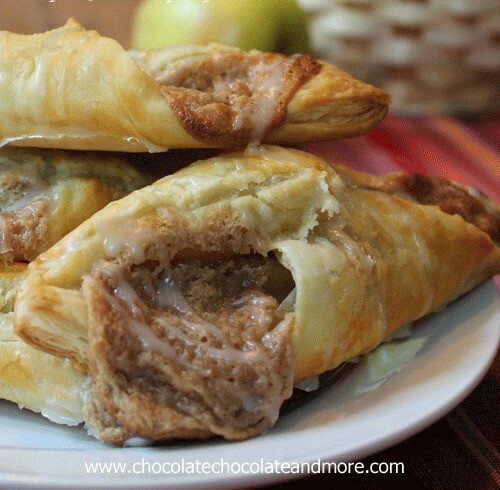 Those refrigerator finds made for a wonderful treat! Thanks so much for sharing on Busy Monday! hi! Thanks for sharing this at Tasteful Tuesdays. You will be featured at this weeks party. The link will go live Monday evening. Make sure to stop by becuase I also have a fantastic pattern sale and giveaway going on! 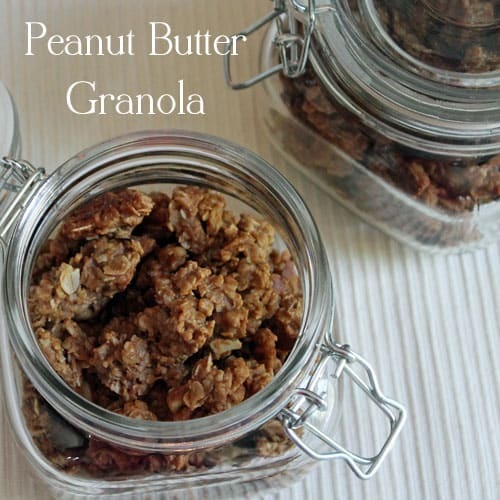 That is such an easy treat and perfect for a lazy Sunday morning! Need to pin this and make soon! Thank you for sharing! 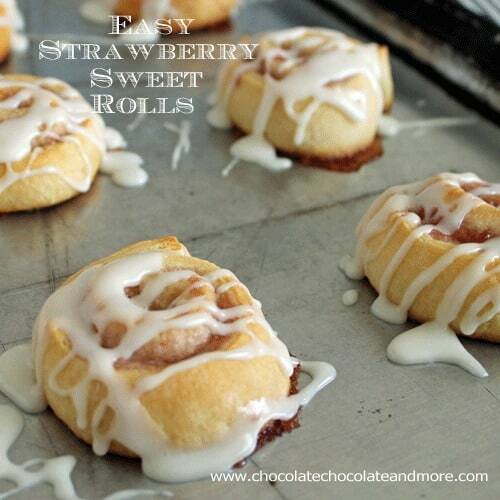 These shortcut sweet rolls look fabulous. 🙂 I made homemade strawberry sweet rolls last weekend Joan! I love dough/strawberries together first thing in the AM! the oozing strawberry jam looks great! 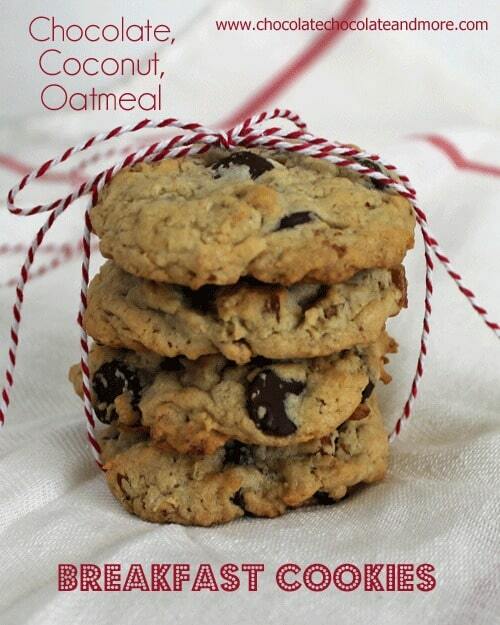 Wouldn’t these be wonderful with chocolate over them!! Thanks for the recipe. I made these this morning, mixing cranberry orange marmalade with strawberry preserves and they were amazing! I’ll bet the strawberry-orange flavor was amazing paired together! This looks great! I think I’m going to substitute the jelly with Nutella! I wouldn’t recommend it. Using canned crescent dough, once you expose the dough to air it starts to “age” for lack of a better term and is best used freshly opened. I know I have tried to save opened crescent dough in a sealed bag in the fridge and ended up throwing it out. I just found your site, I love it. I am allergic to chocolate and am so glad to see some good looking desserts made without chocolate. This one will be on my menu tomorrow as today I have to get a shot in my back and won’t be home to make it, 2.5 hr trip one way. 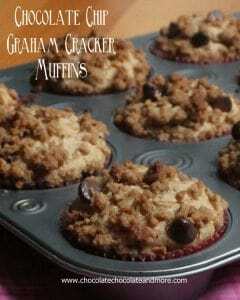 Can’t wait to make these. A big thanks for your site.